Powerful and simple. Tide gives business owners their time back. Spend on your card with no purchase fees. No sneaky foreign transaction fees – spend abroad at no extra cost. Lost your card? Freeze it and reorder it instantly in the app. Forgot your PIN? It’s there too. Automatic income and expenditure labels, or choose your own. Create and pay invoices with a tap - anytime, anywhere. Setup or edit standing orders and one off payments easily. Chat to the tide team with any questions 365 days a year. Access on any device. Share with your accountant or finance team. Pay in cash at the Post Office for only £1 per deposit, or at any PayPoint for 3% of the deposit amount. Transactions are automatically categorised – and you can change them to your own. Give your accountant access to see all of your incomings and outgoings. Stop uploading CSVs – connect your account to Xero, FreeAgent, Sage and others. Attach photos and notes to transactions and declutter your desk. No more meetings about money – order up to 35 cards for your team and see who made which transaction. 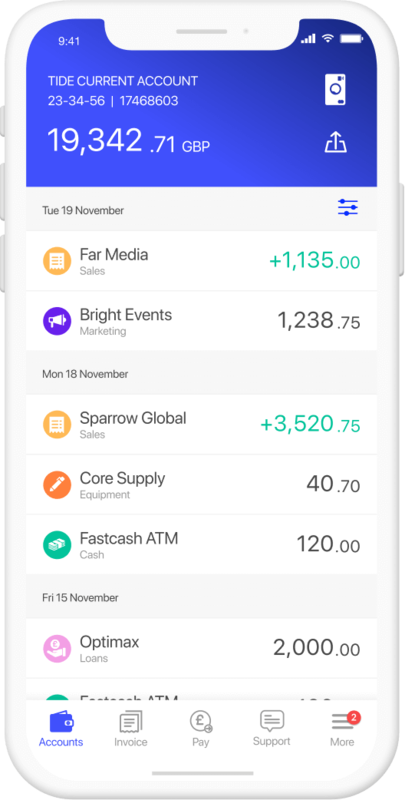 Invite others in your company to view and download your transactions – perfect for Finance and Admin teams. Waiting on that big payment? We’ve teamed up with iwoca to make applying for credit a breeze. Check your limit without impact to your credit score, and repay whenever you want without penalty. We’re powered by PPS, who hold an e-money licence from the FCA and must comply with its rules on capital and safeguarding. 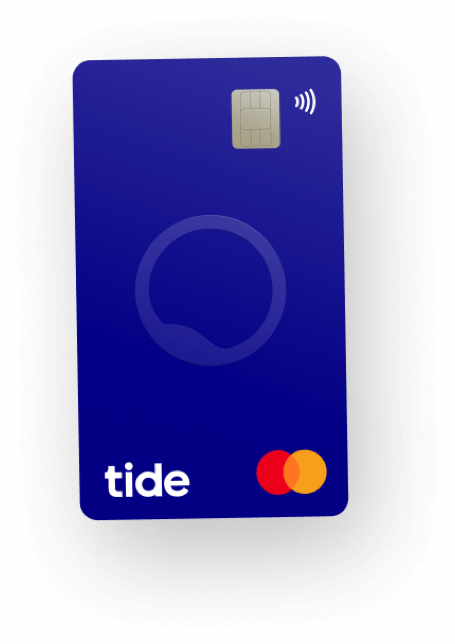 Tide also holds an FCA license as a credit broker. Your money is held in a regulated, ring-fenced account. Your funds are never invested or lent to anyone else. It’s your money and you can access it whenever you wish. Our trusted partner, PrePay Solutions (PPS) is a well-established business, partly owned by Mastercard.